Calculate Square Root . . . without a square root calculator . . . Calculate Square Root - without using a square root calculator . . .
root of a number without a calculator. Four of the most prominent methods are discussed below. Direct Calculation (The Chinese Method) - Probably the most popular method of computing square roots without a calculator. This is a precise, digit by digit calculation similar to long division. It is often found in textbooks. This technique can be modified to calculate cube roots and other roots. Newton's Method (Newton's Method is similar to the Babylonian method, but incorporates mathematical insights gained from calculus.) - It is also a popular method of computing square roots without a calculator. Newton's Method is a fast approximating sequence which converges quickly to a high degree of accuracy . The procedure is straightforward and is easy for anyone to use . However, Newton's Method goes far beyond calculating square roots. It is a numerical method of solving all sorts of complex equations. For example, it can also be used to find numerical solutions to equations containing higher order roots such as cube roots. Guess & Check Method The Guess & Check Method to Calculate Square Roots is easy for anyone to use. If you have access to a simple calculator (without a square root key), this method can be very fast , although its accuracy is limited . This method can also be used to calculate higher order roots such as cube roots. Geometric Diagram The ancient Greeks developed a method for calculating the square root of a number using a geometric construction of circles and triangles. To use this method, you need only a compass and a straight edge . Calculate Square Root . . . Precise, digit by digit method used to Calculate Square Roots (The Chinese Method). 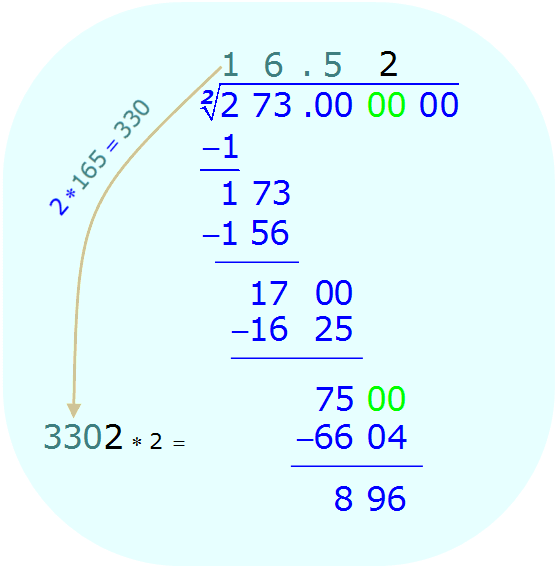 Beginning at the decimal point, divide the radicand into groups of two digits in both directions. The decimal can be extended as far as you wish. Beginning on the left, select the first group of one or two digits. In this example , the first group of digits in the radicand is simply the number 2 . If possible, find the perfect square root (expressed as an integer) of the first group of digits in the radicand. Or, If the first group of digits does not have a perfect square root (expressed as an integer), find the perfect square root of the number closest to, but less than, the first group of digits. In this example , the number 2 does not have a perfect square root (which can be expressed as an integer). The number closest to, but less than, the number 2 which has a perfect square root is the number 1 . The perfect square root of the number 1 is also 1 . Write this number above the radical sign as shown below. Square the answer to step 3, and subtract it from the first group of numbers. In this example , the number 1 squared is subtracted from the number 2 . A - Bring down the next group of two digits. In this example, bring down 73. B - Double the result of step 3 (shown as a slate color), and write on lower left. In this example, the number 1 x 2 = 2. C - Add another digit to the number computed in "B" (the slate colored number) on the lower left. Choose the new digit so that the new number created by the additional digit can be divided into the number on the immediate right the same number of times as the new digit. In this example, the new digit is 6. The resulting number (26), can be divided into 173 a total of 6 times. Repeat steps A, B, and C shown in step 5. In this example, bring down 00. B - Double the result of step 5 (shown as a slate color), and write on lower left. In this example, the number 16 x 2 = 32. In this example, the new digit is 5. The resulting number (325), can be divided into 1700 a total of 5 times. B - Double the result of step 6 (shown as a slate color), and write on lower left. In this example, the number 165 x 2 = 330. In this example, the new digit is 2. The resulting number (3302), can be divided into 7500 a total of 2 times. B - Double the result of step 7 (shown as a slate color), and write on lower left. 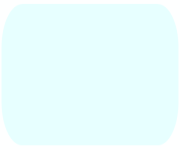 In this example, the number 1652 x 2 = 3304. In this example, the new digit is 2. The resulting number (33042), can be divided into 89600 a total of 2 times. B - Divide the radicand by the estimate in part A. C - refine the estimate by computing the Average of the estimate (from part A) and the quotient (from part B). 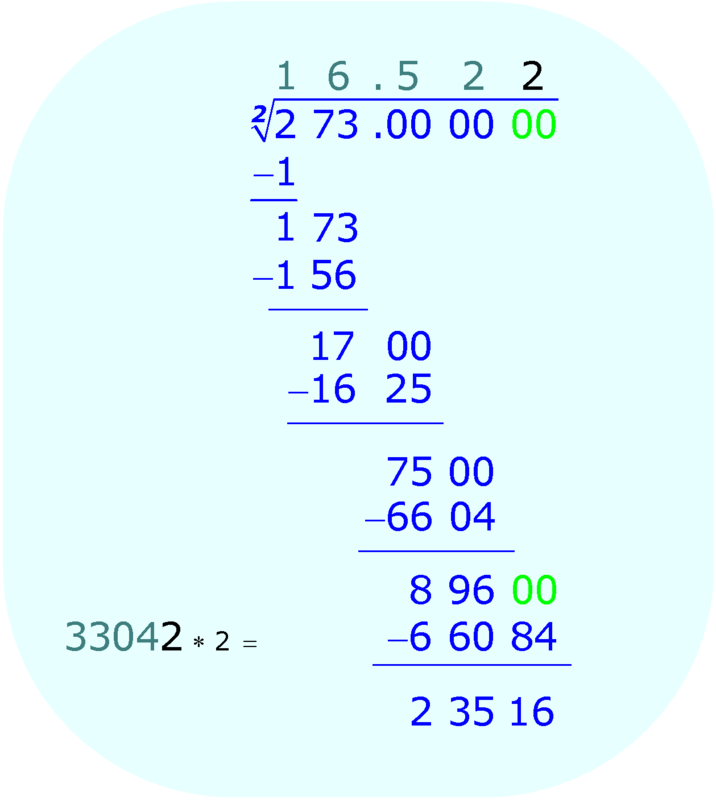 In this example, a good initial estimate for the square root of 273 is 15 . 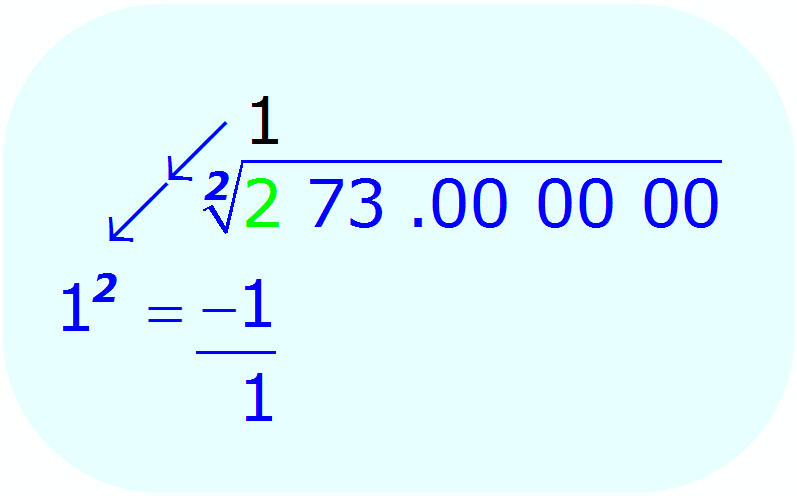 In this example, divide 273 by 15. C - 1st Approximation - refine the initial estimate by computing the Average of the estimate (from part A) and the quotient (from part B). 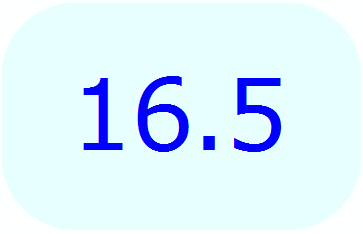 In this example, , find the average of 15 and 18.2 . A - Initial Estimate for the 2nd Approximation of the square root of the radicand. Use the results of the 1st Approximation, part C, above. 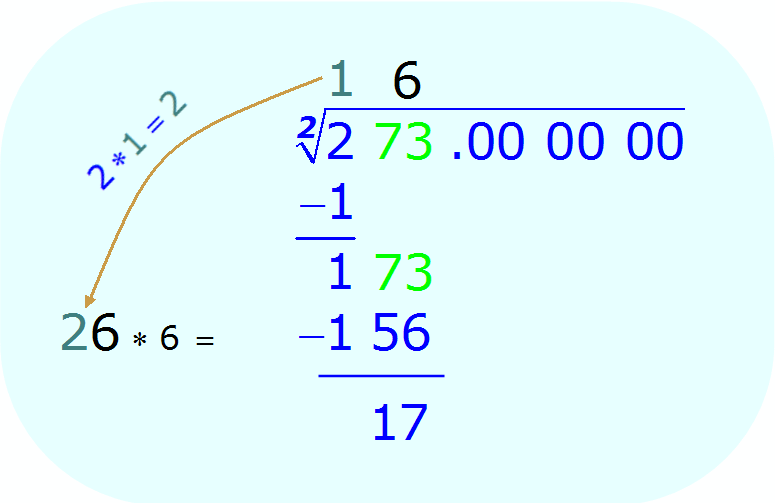 In this example, divide 273 by 16.6 . C - 2nd Approximation - refine the initial estimate by computing the Average of the estimate (from part A) and the quotient (from part B). 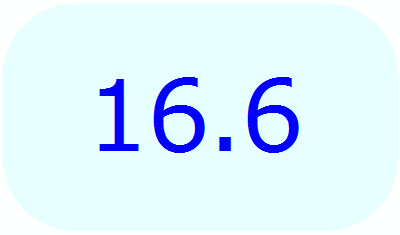 In this example, , find the average of 16.6 and 16.445783 . A - Initial Estimate for the 3rd Approximation of the square root of the radicand. Use the results of the 2nd Approximation, part C, above. 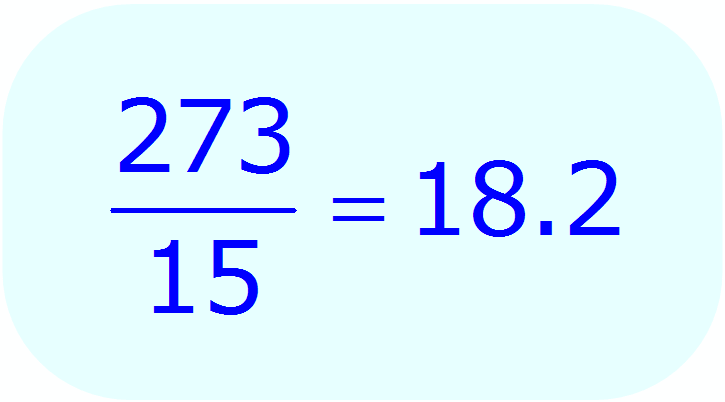 In this example, divide 273 by 16.522892 . C - 3rd Approximation - refine the initial estimate by computing the Average of the estimate (from part A) and the quotient (from part B). 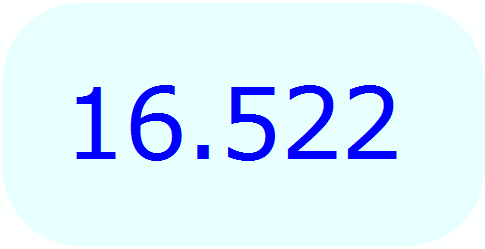 In this example, , find the average of 16.522892 and 16.522531 . Using the Guess & Check Method to Calculate Square Roots is exactly what the name implies: Guess what the value of the square root might be, then multiply your guess by itself to see if the product is equal to the original radicand. B - Multiply the estimate by itself. C - Check - Compare the product obtained in step "B" (above) with the radicand. D - Refine the Estimate . If the product obtained in step "B" (above) is greater than the radicand, decrease the estimate. If the product obtained in step "B" (above) is less than the radicand, increase the estimate. E - Repeat steps B through D until the estimate is an accurate square root of the radicand. A - Guess - Initial Estimate of the square root of the radicand. In this example , multiply 15 by 15 . 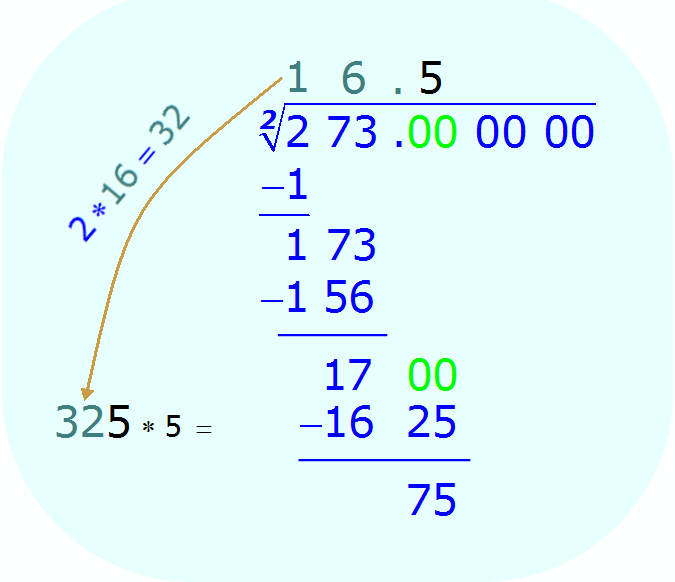 In this example, 225 is less than 273. In this example, since 225 is less than 273 the estimate will be increased from 15 to 16 . A - Guess - Initial Estimate of the square root of the radicand. Use the results of the 1st Approximation, part D, above. 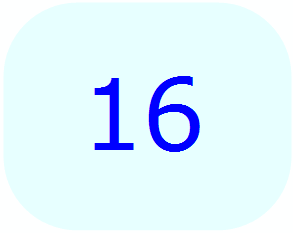 In this example , multiply 16 by 16. In this example, 256 is still less than 273. In this example , since 256 is less than 273 (but closer than the original estimate) the estimate will be increased a small amount, from 16 to 16.5 . A - Guess - Initial Estimate of the square root of the radicand. Use the results of the 2nd Approximation, part D, above. In this example, 272.25 is still less than 273 , but it is much closer than the other estimates. In this example , since 272.25 is less than 273 (but much closer than the other two estimates) the estimate should be increased slightly .